" KORG LP-350 "LIFESTYLE" Digital Piano"
WINTER NAMM SHOW, ANAHEIM, CA, January 15, 2009 — Korg unveils the LP-350 Digital Piano, featuring rich and expressive, realistic piano sound based on the latest Korg sampling technology. This full 88-note keyboard is specially designed to complement the modern lifestyle in a fashionable and functional, yet unobtrusive way. Measuring a mere 10.9" deep, the slim-line cabinet design fits easily into nearly any environment, and two available finishes complement nearly any décor – chic black or elegant white. Even when not in use, the LP-350 is a welcome enhancement to a living space or commercial location, with a sleek, smooth top and no exposed hinges. This allows the piano to easily blend into the room and even be used as a small table or desk. 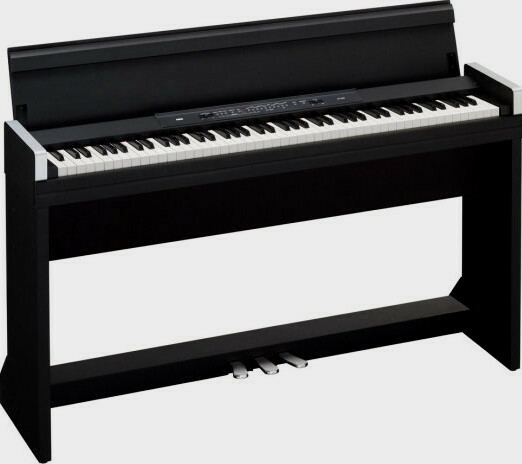 It’s perfect for young professionals, apartment dwellers, churches, restaurants, or anyone looking for a space-saving, visually beautiful digital piano. Although compact in design, the LP-350 offers a remarkably accurate acoustic piano experience. It features Korg’s finest piano touch and feel, and its RH3 graded hammer action is engineered to crisply perform repeated note strikes. Three levels of touch sensitivity are available, allowing players to customize the dynamic response to their own playing style. The hammer weighting gets progressively lighter as a player moves up the keyboard, and the key cover is a true slow-closing fallboard, just like on a concert grand. All three pedals from a concert grand are included (damper, soft and sostenuto), and the damper and soft pedal feature expressive and nuanced half-pedaling. When open, the key cover transforms into an expansive sheet music stand. The LP-350’s piano sounds are rich and luxurious, with stereo samples from a concert grand piano taken at multiple velocities to capture and reproduce the entire dynamic range with clarity. Electric pianos, clavs and harpsichords, church and jazz organs, mallet percussion, guitar, strings, choirs and lush pads round out the sound offerings. Two sounds can be layered together for rich blends, with Reverb and Chorus effects able to be added to any of the thirty on-board sounds. The tuning is adjustable to match other instruments, and users can transpose the LP-350 into any key to play along with any musician, instrument or range. Two historical non-equal temperaments add authentic voicing to Baroque and Classical performances. A built-in metronome is also included for practice purposes. A robust sound system is integrated into the unit’s cabinet. Two large 10-cm speakers are mounted in a bass-reflex chamber and powered by a pair of 11-Watt amplifiers, to deliver a rich, refined sound. For private use, dual headphone outputs allow parent and child, student and teacher, or friends to share the instrument together. The LP-350 is also equipped with MIDI In/Out, allowing access to a home computer or other MIDI device.